Ideally situated New Style Hotel in the shopping district of Myeongdong! ! 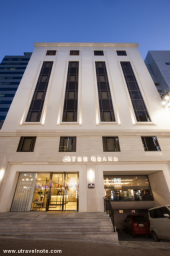 The Grand Hotel Myeongdong is ideally located in the heart of Myeongdong, the most thriving business and shopping area of Seoul. The Grand Hotel is just a 1-minute walk from Myeongdong Subway Station (Line#4, Exit #10), which is also an Airport Limousine and Local Bus Stop. The Grand Hotel is a 5-minute walk from Namedaemun Market, and 2 Subway Stations away from Dongdaemum Market (Line#4). The Grand Hotel Myeongdong features Wi-Fi access in all areas. It also has a business center, a lobby lounge offering free take-out coffee, and a beautiful rooftop garden. Non-smoking air-conditioned rooms are equipped with a 41 or 37-inch flat-screen TV with cable channels, a refrigerator and a sitting area. The attached bathrooms have a bathtub and free Innisfree toiletries. A 24-hour luggage storage facilities are available at the front desk, and self-laundry & self-ironing services are available free of charge. The Grand Hotel Myeongdong houses a restaurant which serves daily breakfast buffets. Guests can also dine at various restaurants available in the area.